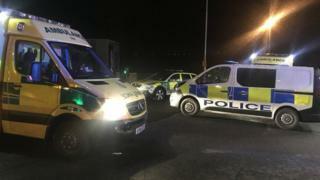 Nine people, including children, suspected of entering the UK illegally have been recovered from the back of a lorry at a motorway services. Bedfordshire Police found six adults and three children "from the continent" of a "mixture of ages and sexes" at the northbound M1 Toddington services. They were checked over by paramedics at the scene and taken to hospital, after police were called at about 05:15 GMT. The group has since been transferred to police custody in Luton. The investigation has been handed over to immigration enforcement officers, Bedfordshire Police said.